One night last winter two UPS guys arrived in the dark to deliver a dozen boxes of the flooring materials for my studio. I had started a series of paintings of people at work (still in progress) and asked if I could take their photo to use for a painting. They agreed and were great models! Since I took the photos at night without flash outside lit only by the fluorescent lights from inside the studio, the photo was dark and the colors were, well, mostly brown. 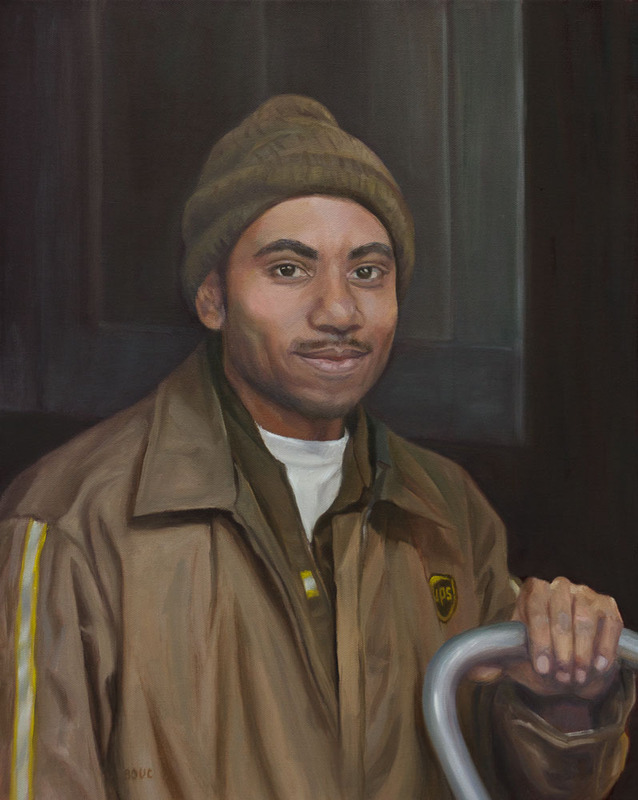 But the UPS slogan is right, BROWN really does deliver! Who knew there were so many shades of brown? I must have mixed a hundred different browns. Below are photos showing the process of drawing and painting this portrait. Since drawing is the most critical part of a portrait, I used Photoshop to check my accuracy (or lack thereof). I take a photo of the work in progress and after adjusting the size to match, layer it on top of the reference photo with about 40% transparency so I can see the original photo through the photo of the artwork. Then I add another layer on top and trace over the areas that need correction with a colored line. If you click on any of the thumbnails you can see a larger image in a side-show format. 5-Started with a burnt sienna underpainting and added dark background. You can see the photo I’m working from on iPad on easel. Stunning portrait! Thank you explaining your process. I had to share on my Facebook page — I hope you don’t mind. Hi Lisa, Send me a photo of you at work or in your uniform if you wear one, and if I can will be happy to try to draw or paint you. I absolutely love this portrait. You’re captured a lovely person with a wonderful face and smile. Thanks for sharing the thumbnail sketches too. I’m not so technologically savvy to understand what you did in photoshop, but it was interesting to look at. 🙂 Great painting. Oh, what a great portrait, Jana. And I always love to watch you go through the process. Such fun, and I learn so much from it– a really helpful tutorial. Thank you. Thank you for your generosity in sharing the steps involved in creating this marvelous portrait!!! You are an inspiration! We have wild turkeys on our farm. Sometimes they come across our yard, but often I see them while out hiking. There are flocks of wild turkeys in my area too, but none were around right before Thanksgiving. They must have been hiding out, just in case. Wow! That is an amazing portrait. You paint everything so well but portraits may be your forte. I do love painting people; it’s the ultimate challenge and gives the opportunity to really study someone as you get to know their face. Wonderful portrait — it delivers so much more than the image, it’s got such depth of character and an aura of contentment. Thanks for sharing your process. You make me want to learn to paint with oils! Very nice job…it is just beautiful! Beautiful browns– this is fabulous Jana! This is an awesome portrait. Thanks for sharing the steps too. Jana, I have had to just come back here, again and again, to enjoy this portrait. There is so much to see and feel in this special face. Amazing work! His personality sure shines thru!